Ditch the normal living, take a break and get in touch with yourselves in the relaxed natural environment of Lalanathi. 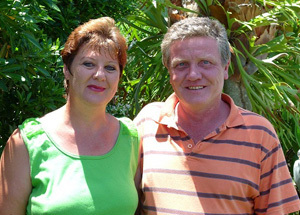 Let your hosts Charlotte and Barry help make your stay a memorable one leaving you relaxed but energised. Why don’t you bring your tent, caravan, trailer tent or motorhome and let us help you enjoy your stay to its’ fullest. Allow the rhythmic drum-like sound of the waves soothe away the stresses of city life. We offer 45, well spaced out to offer individual privacy, level grassed and shaded sites, all electrified with water close by – within a fully fenced and secure area. Clean ablution and scullery facilities with plenty of hot water. We have added another ablution block at the back of the park. Let us spoil you with magnificent scenery, great fishing and beautiful beach walks on our unspoilt beach. Swim, fish, surf and sunbathe to your hearts’ content or just relax around a campfire in the natural and tranquil surroundings of Lalanathi. All round entertainment for the whole family from the thrill of sandcastle building on the beach, exploring rock pools to playing volleyball. We have a play area for little people, a trampoline, swimming pool and for the teens a lapa with big screen TV, DSTV, pool table and darts. We are surrounded by fun family outings from the serene butterfly dome at MacBananas to the exhilarating Lake Eland Game Reserve and the longest zip line of 4.5km in Africa. Riverbend Coffee Plantation Oribi Gorge and the Wild Five and if you are feeling lucky the Wild Cost Sun and Casino only 45 minutes away. 8 Golf courses in the area include Port Shepstone, Margate, Selborne Park, Umdoni Park and Southbroom to name but a few. Shop-o-holics and those needing to get touch with their usual normal humdrum city lives can go to the movies at Shelley Centre and Margate.